Many traders repeatedly ask for SMS alerts on their phones. 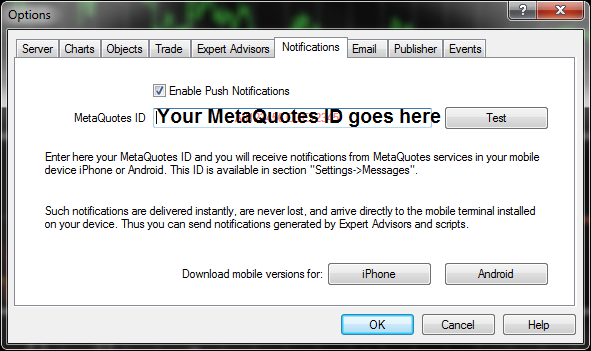 That solution is now outdated with MetaQuotes release of build 445, which introduces MT4 push notifications. SMS alerts are a headache to set up in MT4. The great thing about push notifications is that they look exactly like an SMS message and require very little effort. The only difference is that MT4 push notifications show up with the MetaTrader logo. These alerts only show up if you modify the source code of your expert advior or custom indicator. It’s as simple as programming can possibly get. Everywhere in the code where the word “Alert” or “SendEmail” appears, add a new line with “SendNotification()”. More details on push notifications are available in the MQL4 documentation. The steps to set up push notifications are straight forward. Start by obtaining the MetaQuotes ID. Open MT4 on your Android or iPhone. When the application loads, access the settings button. I did this on my LG Optimus V by clicking the left most button. Your phone will more than likely have that button in another location. Once you open settings, scroll down until you find the MetaQuotes ID. Write this number down and save it in another location. Open MetaTrader 4 on your desktop or VPS. Go to Tools, then select Options. At the top of the screen in MetaTrader 4, click on the word “Tools”, then on “Options”. A new window pops up. Select the tab labeled Notifications. Put a check mark next to the word “Enable Notifications”. Type in the MetaQuotes ID that you saved in the first step. 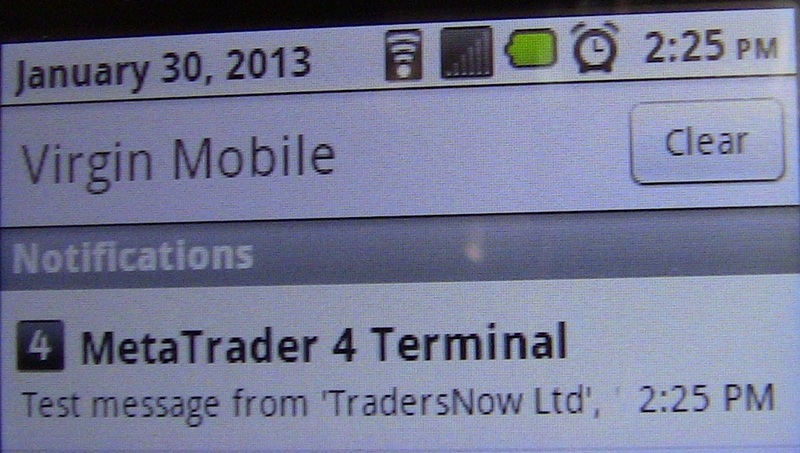 The MT4 notifications tab on the desktop sets up the ability to push notifications to your phone. 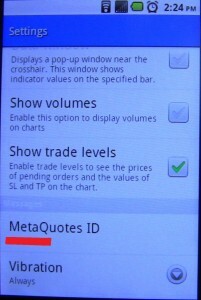 Put a check next to “Enable” and make sure to type in the MetaQuotes ID that matches your phone. Now that you’re finished, make sure that it works by pressing the Test button. You should receive a message on your phone within 5-10 seconds. The actual delivery time of the message depends entirely on your reception area and carrier. Alerts on the desktop version of MetaTader are instantaneous. Email, SMS and MT4 push notifications can take substantially longer. The best case scenario is 1 second. Somtimes, it might take a network 20-30 seconds to receive the alert. The notifications are fantastic for general tasks like tracking an expert advisor’s open trades. If you need to place trades within seconds of receiving an alert, this setup is not for you. The latency between sending and receiving a message is far too great. Very cool newer MT4 feature. I have just a typical, inexpensive cellphone that is neither an iPhone, nor android. Even so, since I can use it to send/receive text (SMS) messages, is there a way to easily get an MT4 EA to send text notifications to a non-apple/non-android phone? Thanks for your question. 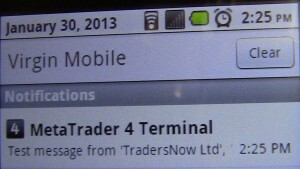 You can set up email alerts within MT4, which are sent to your cell phone. Most cell providers offer the ability to email an SMS message. This is an example of how to do it with AT&T. You can do a similar search for your carrier. MT5 already supports mobile push notifications, just like MT4. Push notifications were working fine, but now have stoped “Notifications failed send request 0”. It is a demo account so I am wondering if that has something to do with it? Thanks for letting me know the message. My first instinct is to look up the error code. 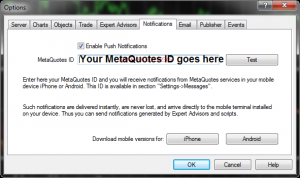 The text that you typed doesn’t match any of the error codes in MetaTrader. Can you email me a screenshot of wherever you see that text? I also encountered the same problem as Andrew. Push notification was working fine but now it failed to send suddenly. Journal message shows “Notifications: failed send request ()”. Do you know what’s wrong? Thanks. Honestly, I’m not sure off the top of my head. Hi this is just what I have been looking for, please I have an indicator I want to add the SendNotification() to, I dont want to mess this up ad I do not have any knowledge about coding please what do I do? do you have any recomendations? Thanks for the comment. You can either try adding it yourself or you can email info@onestepremoved.com and request an estimate. There is an ‘ea’ which can send you push notifications, and not in text/sms but to the mt4 app in your smartphone. Try ‘notifier ea’, i am using it for more than 7 months now, cheap and good to get push notifications. Thanks, I’ve used notifier ea and push notification works well. The problem in mt4 iPhone, how to delete the Messages? In Android we can do easily. I’m not sure to be honest. I only use Android. Have you set up the send notifications before running your indicator? is it possible to get the notification on my IPhone even when the MT4 is not opened at my PC? Or PC is down? I wish there was. You have to have MT4 open somewhere 24 hours a day, whether it’s on your computer or VPS. Is it possible to stop my EA via counter notification? Not without modifying the source code. Hola, aparte de las notificaciones push, ¿se puede enviar mensajes a múltiples correos electronicos? Sólo si se envía un correo electrónico y luego recibe ese correo electrónico en varios dispositivos. I know it was some time ago that someone was asking about how to remove notifications if using Metatrader iOS mobile. I too have been looking and have now found the answer. I share it here for those that land here looking for an answer. 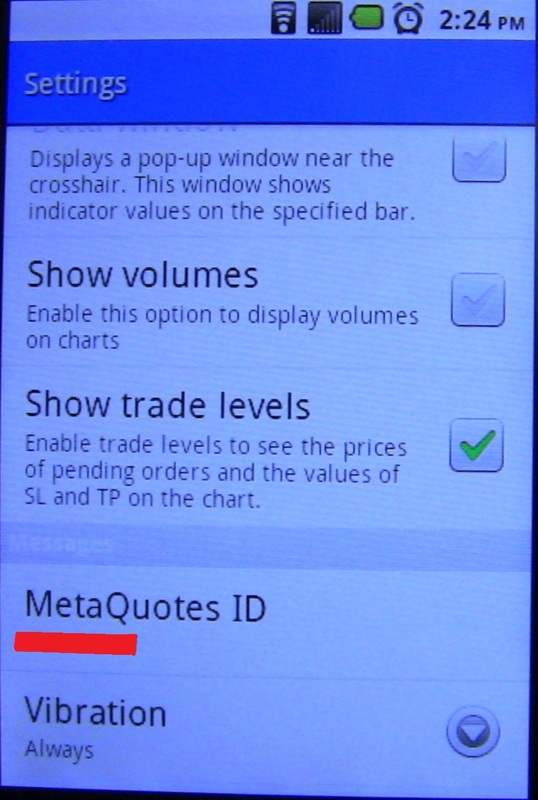 Open metatrader on the phone / tablet, go to settings, then messages. You will see the menu item called ‘Other’ hold and slide it to the left and you will be presented with the option to CLEAN. Remember: this cleans out everything from your notifications. Do the notifications still work while the computer is turned off? Your computer must remain on in order to receive push notifications. Thanks for sharing the instructions for how to get notifications on my phone. I’m following a swing trading strategy and speed of execution of my trades is not important and sometimes I don’t want to set up a limit order, but would rather wait until price reaches the level that I’m interested in looking at. This helps me do exactly that. how can i configure MT4 to send me text message (sms) to my mobile when a certain price hits a level? You would have to do lots of custom tweaks and modifications. It’s completely not worth doing – just do push notifications. Yes. You need to install MT4’s mobile app on the two recipient phones. how can I do? thanks. I have paid for mt4 vps in order to receive notifications while my computer is off, but nothing is any different than the time i didn’t have vps. Every thing about VPS seems to be connected , but i don’t receive any signals just after I turn on my computer, they all show up. Thanks in advance for help. Alerts don’t make an external notifications. You would need to have indicators with push notifications to accomplish your goal. How does the forex market work? What's happening in the current markets? Copyright © 2019 OneStepRemoved.com, Inc. All Rights Reserved.